New survey research sheds light on biggest alignment gaps between retailers and their suppliers, and how to close them. Everyone seems to agree that collaboration between retailers and suppli­ers promotes a leaner, more profitable supply chain for all. But the pace of collaborative initiatives has been slow. To understand why, Peerless Research Group interviewed logistics executives at both retailers and CPG manufacturers on issues ranging from forecasting and communication to information systems and partnership commitment. 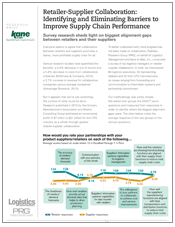 This report summarizes the results of that Q4 2015 research, which provides insights into the biggest areas of misalignment between retailers and their suppliers, and how to close these gaps.